The local mooring strategy steering group met again on 8 November. We are able to provide notes of most of the discussion, taken by a volunteer, which are at the end of this article. Our busy freedom of information bees have turned up yet more evidence that the local mooring strategy is inspired by a vicious combination of prejudice against liveaboard boaters and BW’s desire to extract the maximum profit wherever it can. Hello everyone… KevThePipe calling all artists and performers! The K&A Bicentenary event is taking place at Bathampton Wharf, Saturday 17th July all day, kids stuff in the daytime, bands and films in the evening. I know word is getting around about this event so now is the time to start getting our arses in gear! The event is basically being organized by Bathampton residents with the Parish Council providing funding, insurance etc. I’ve been involved from the beginning and I’ve made sure boaters are well represented and we’ll be providing lots of infrastructure but I now need to know who’s up for doing a turn on the stage. I’ve spoken to a few but need you all to spread the word and get me definite ‘acts’ so I can schedule them in… I’m stage managing the event so my word is law! contact me in person on ‘Stanley’, by email kevaitch@hotmail.com, by phone 07796 560476 or get me on FaceBook. Great efforts have been made to repair the relationship between Bathampton residents and boaters and now’s our chance to shine… so come on you stars! The corruption of British Waterways is now endemic and pervades every thing that they do. Recently, one of our correspondents sent this letter to the Clerk to the Council of Bathampton Parish Council about several serious allegations made by Keith Rossiter and councillors from Claverton and Monkton Combe. One of our correpondents has sent this letter to the Clerk of Bathampton Parish Council following publication of these allegations by Keith Rossiter on this site. We eagerly await their reply. 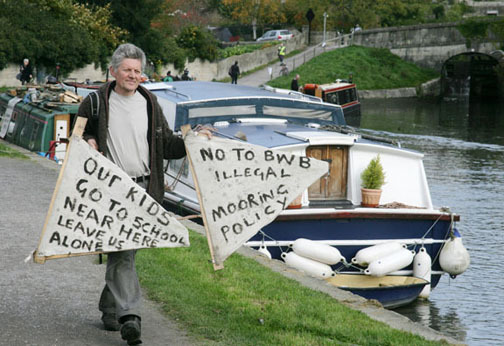 It has recently reached my attention that Keith Rossiter, of Bathampton Parish Council, has in a formal way made the following allegation against un-named boaters on the Kennet and Avon canal within Bathampton Parish. “threaten anyone who chooses to call attention to the situation”. These are two amongst other allegations made in the same minutes and in protracted correspondence between Mr Rossiter and British Waterways by email. You will appreciate that these are very serious allegations involving breaches of the criminal law. Can you please confirm that these allegations are the true position of Bathampton Parish Council as made by your representative to the body with the responsibility of managing the canals and that the intention is for British Waterways to take action over these offences. Can you also confirm that Mr Rossiter is authorised to speak on behalf of Bathampton Parish Council to British Waterways and that the correspondence he has had with them is on behalf of, and the true voice of, the Parish Council. Thank you for you prompt attention to this matter. Well, boaties and other interested parties, we have another pile of stuff to sift through and publish, a series of email exchanges between Keith Rossiter of Bathampton Parish Council and Sally Ash of British Waterways. and the minutes of another meeting, this time on 10th September, follow up to the meetings and plans in our earlier report on thr Outer Zone. I really like that ‘family with picnic tables’ Keith, can’t have that in old blighty, what, families with picnic tables, whatever next? Maybe vagrants in a disused building – love the language Keith, I haven’t heard the term vagrant in many a year, doesn’t it have a precise definition, did you check whether they had 12 pence in their pockets or offer them a train ticket? an “outbreak of chickens” – priceless, is that like measles? And on the other side, we finally have an out-in-the-open, tellit how she sees it polemic from Sally Ash, glamorous sidekick of Simon ‘Satan’ Salem. “Living afloat is being perceived as an attractive and economical choice by increasing numbers of people, particularly on the edge of our towns and cities. Bath is no exception and we have been concerned for some time at the number of boats that have simply ‘put down roots’ without our permission along the towpath between Bath and Bradford-on-Avon. “Parish councils’ perspective on canal issues. moor long-term in one location or ‘bridge hop’ in an attempt to masquerade as continuous cruisers. treat the towpath and adjacent land as their own back garden, workshop or farmyard. threaten anyone who chooses to call attention to the situation. Now come along Keith, there’s some pretty strong accusations in there. Threaten anyone who choose to call attention to the situation” – Last time I heard, threatening behaviour was a criminal offence, why have you made no complaint to the police about this? Again because it is an unfounded slur, slung out in the hope of painting a picture that might be believable to a couple of officers from British Waterways fresh from the corporate towers of Watford but bearing little reality to the real world. So how does he respond to a concerned letter from a former member of the Bathampton Parish Council? zones and the other of parking – and I have separated these in my reply. bring clarity to mooring policy. We expect the proposed national mooring policy to be published in November. Now this man could go far, with dissembling skills of this magnitude there must be a place for him in more rarified political halls than Bathampton Parish Council.